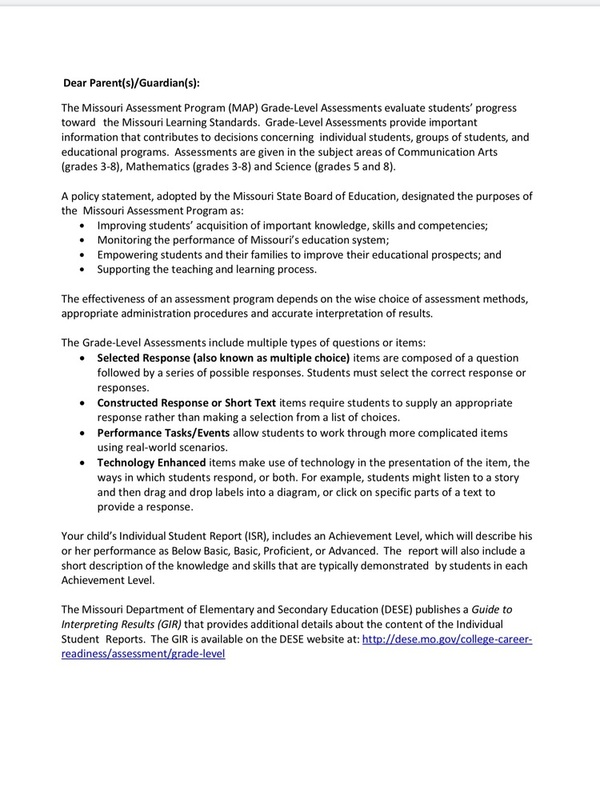 The Missouri Assessment Program (MAP) Grade-Level Assessments evaluate students’ progress toward the Missouri Learning Standards. Grade-Level Assessments provide important information that contributes to decisions concerning individual students, groups of students, and educational programs. Assessments are given in the subject areas of Communication Arts (grades 3-8), Mathematics (grades 3-8) and Science (grades 5 and 8). • Supporting the teaching and learning process. The effectiveness of an assessment program depends on the wise choice of assessment methods, appropriate administration procedures and accurate interpretation of results. • Selected Response (also known as multiple choice) items are composed of a question followed by a series of possible responses. Students must select the correct response or responses. • Constructed Response or Short Text items require students to supply an appropriate response rather than making a selection from a list of choices. • Performance Tasks/Events allow students to work through more complicated items using real-world scenarios. • Technology Enhanced items make use of technology in the presentation of the item, the ways in which students respond, or both. For example, students might listen to a story and then drag and drop labels into a diagram, or click on specific parts of a text to provide a response. Your child’s Individual Student Report (ISR), includes an Achievement Level, which will describe his or her performance as Below Basic, Basic, Proficient, or Advanced. The report will also include a short description of the knowledge and skills that are typically demonstrated by students in each Achievement Level.